AUTO (VC): When placed, during that turn, this Unit gains Power+10000. AUTO (RC): When your Vanguard is placed, during that turn, 1 of your Vanguards and this Unit gain Power+5000. 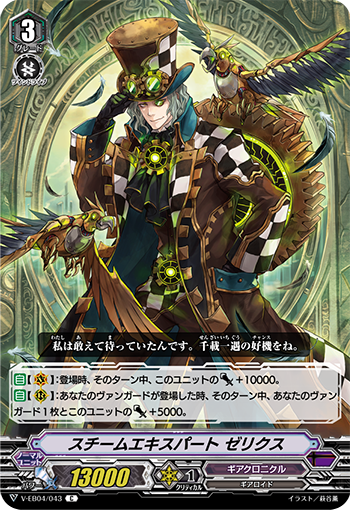 ACT (RC) 1/Turn: COST [Counter Blast 1 & Bind 1 card from your hand], choose 1 of your opponent’s front row Rear-guards, place it on the bottom of the Deck, then Call 1 “Steam Expert, Xeris” from your Drop Zone to (RC). If there is a “Steam Fighter, Memenne” on one of your (RC), you can Ride it as Stand instead of Calling it. AUTO (RC) 1/Turn: When your Vanguard is placed, draw 1 card, then discard 1 card from your hand. If you discard a Grade 3 or higher, during that turn, 3 of your Units gain Power+5000.